It has been a busy year so far for all of the KEVIGS sports teams, with this new academic year already commemorating a lot of successes, despite the students only being back for a mere six weeks. During September, the year eight and year ten netball and football teams competed at district level, with all teams remaining unbeaten in both leagues. The year 11 netball team are super zone championships, beating local grammar schools. They will be competing in the county finals in November. At counties, the year ten boys are cricket county champions, beating The King’s School, Grantham in the final. KEVIGS, once again, are talented enough to have athletic champions: Isabelle Dhami (yr11) in the 1500m/steeple chase, Caleb Stephenson (yr11) in the 800m, Jayden Daniels (yr11) in the 3000m and Scott Smith (yr13) in triple jump. On top of that, we have to give credit to our reigning champions Daniel Jewel (400m) and Devon Low (800m) who were unable to defend their titles in June due to GCSE exam commitments. In tennis, all four teams that competed entered county championships with all teams reaching the finals. The year nine and ten girls won and will be going on to regionals. KEVIGS had five swimming teams that competed at Nottingham High School for regional championships. All teams swam well, and the year nine/ten girls’ team won the medley and freestyle relays with a time seven seconds faster than last year’s! Currently, they’re waiting to see if their times were fast enough to put them through to nationals. The team included Beth Crump (yr9), Phoebe Payne (yr9), Eloise Burke (yr10) and Lucy Parker (yr9). The year nine/ten girls’ tennis team competed at the championships in Loughborough, beating Oakham School. The girls played impressively, only narrowly losing at the end. The team included Imogen Wherry (yr10), Molly Carter (yr9), Albany Peplinski (yr10) and Gabrielle Spencer (yr10). In the world of cross country, four teams competed at Snowdon Playing Fields, Peterborough. All of the students performed sound with the junior boys (year seven) and junior girls (year eight) qualifying for the Sheffield finals in November. 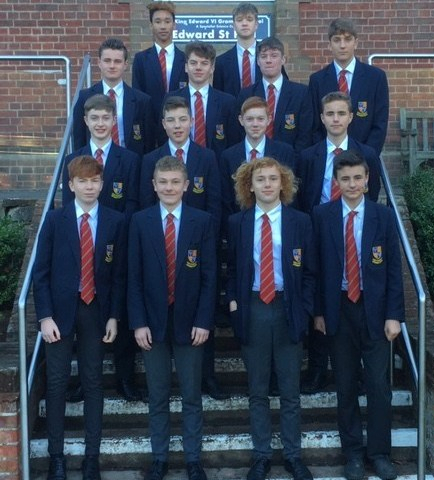 The junior boys’ team consisted of Thomas Allis, Josh Brindle, Luke Brumpton, William Day, Oliver Girdley and Lucas Jex. The junior girls’ team consisted of Emily Blythe, Lara Buck, Franchesca Cook, Emily Davies, Caitlin Hall and Adela Mills. Musical Theatre Returns to KEVIGS!